How many devices do you have with you right now that rely on batteries? Right now on my desk, I have three. There are times at home when I’m sure I have more than five (if I include all my Bluetooth-connected devices). If any of these batteries failed, there would be some disorder while I searched for replacements. I’d head immediately to the kitchen junk drawer where spare batteries always end up (and by the way, storing loose batteries in your junk drawer is not a good idea at all, but that’s a whole other story). Healthcare facilities rely on the batteries embedded in their UPS systems to provide smooth power “ride-through” between the gap of lost utility power and back-up generators ramping up to full functionality. Obviously, these types of batteries aren’t found in your average junk drawer. Having to look for batteries when your lights go out at home can be frustrating; however, battery failure in your UPS during an emergency can be more than frustrating – it has dire consequences. These systems must work 100% of the time. Infusion machines, ventilators, defibrillators, feeding pumps, ultrasound machines – patients’ lives depend on their proper operation, and these machines all depend on electrical power. A healthcare facility manager told me recently that during his thirty year career at his hospital, his generator “failed to start three times. Fortunately, this was during a test. Every time, the cause was premature battery failure”. Thankfully, systems are available that can monitor battery health, and warn of premature battery failure. These are solutions designed to capture battery voltage signatures during generator starts. Signatures are compared over time and analyzed for cumulative differences. The disparity between signatures makes it possible to tell when batteries need to be replaced or when the starter motor needs maintenance. The advantage here is very accurate “just in time” maintenance, so you know exactly when it’s time to replace that battery, and only when it’s necessary. These systems can also monitor room and individual battery temperature changes for thermal runaway, shorted cells, open circuit, and bad batteries – sending alarms to key personnel so crucial situations are resolved quickly. They also help avoid over-charging, and monitor voltage and current to make sure each battery is always ready for use. There are browser-based solutions too, that integrate easily with existing building management systems too, sending alarms and monitoring data points so you can manage critical building infrastructure within a single system. With the right system, you can even use data and event logging to identify problem trends before they escalate or to pinpoint timing or the sequence of events leading up to an incident. Some solutions even make it possible for simple telnet sessions or SSH for remote battery management access. 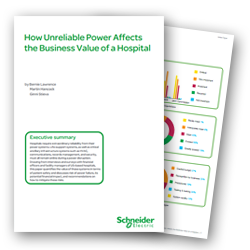 > For more information, download this FREE white paper, and discover the ways your UPS battery maintenance can have a positive effect on the business value of your healthcare facility. I’ve recently kicked off a project at a 4,000+ employee client to try to identify all of the UPS systems in their organization across their 23 global locations so we can get a handle on their battery life cycles. Predictably, some of those systems already identified are running on their factory-installed batteries that are more than a decade old. Ideally, I’d like to get network management cards in all of these and add them to the client’s device inventory in Data Center Expert. There’s a lot of data collection that has to be done through on-site contacts so we can include model numbers, serial numbers, battery configurations (e.g. expansion packs), commission dates, battery replacement dates, and more, but all of these are critical for maintaining a UPS infrastructure remotely. This is a great start, Nathan. I visited a hospital recently which suffered a site wide outage due to one UPS malfunctioning. This UPS was responsible for the MV automation, and failed during a utility outage. The cause of failure was traced back to the UPS battery.